Some people have said that the age difference was the biggest problem. True, Charlie is 80 and Star is 27, but mostly people were concerned about a young, stupid woman marrying a psychotic, paranoid serial killer. But could you really blame Star for falling so hard for all that charisma? And wanting to put his corpse on display in a glass case and charge admission? Charles thought this idea was ridiculous because according to him, he has no plans to die! Charles Milles Manson (born Charles Milles Maddox, November 12, 1934) is an American criminal and musician who led what became known as the Manson Family, a quasi-commune that arose in the California desert in the late 1960s. In 1971 he was found guilty of conspiracy to commit the murders of seven people, actress Sharon Tate and four other people at Tate’s home, and the next day, a married couple, Leno and Rosemary LaBianca, all carried out by members of the group at his instruction. He was convicted of the murders through the joint-responsibility rule, which makes each member of a conspiracy guilty of crimes his fellow conspirators commit in furtherance of the conspiracy’s objective. His followers also murdered several other people at other times and locations, and Manson was also convicted for two of these other murders (of Gary Hinman and Donald “Shorty” Shea). Manson believed in what he called “Helter Skelter”, a term he took from the song of the same name by the Beatles. Manson believed Helter Skelter to be an impending apocalyptic race war, which he described in his own version of the lyrics to the Beatles’ song. He believed the murders would help precipitate that war. From the beginning of his notoriety, a pop culture arose around him in which he ultimately became an emblem of insanity, violence and the macabre. The term “helter skelter” was later used by Manson prosecutor Vincent Bugliosi as the title of a book that he wrote about the Manson murders. 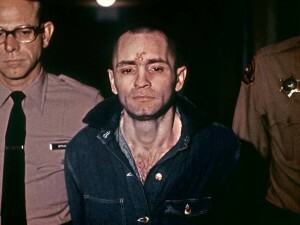 Manson’s death sentence was automatically commuted to life imprisonment when a 1972 decision by the Supreme Court of California temporarily eliminated the state’s death penalty. 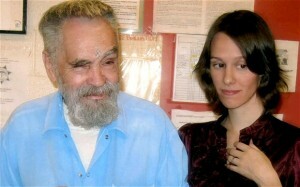 California’s eventual reinstatement of capital punishment did not affect Manson, who is currently incarcerated at Corcoran State Prison. 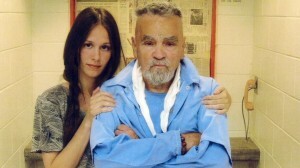 By canustillhearme • Entertainment, Home, News • 0 • Tags: Charles Manson, Charles Manson's wedding is off!